I’m concerned when people lose faith in politics and I’m equally concerned when people have too much faith in politics and see government as the answer to everything. Politics is important and government is important, but it is not the ultimate. We need to be faithful to Christ first, and then see where he’s called us to be engaged. Politics is one of those places. Quotes like this and many more throughout the book are the reason I so appreciated it. 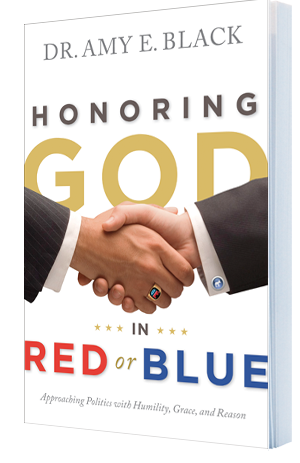 Black exhibits a wonderful balance between upholding the importance of political engagement and pressing the reader to honor Christ in all things. For someone like me, who tends to avoid all things political, this book was a spur to consider, to listen, to learn, and to act. For others who love the thrill of a good political rumble it is a helpful set of brakes on mind and mouth alike. All in all, it’s a really helpful book for people on both sides of the political lines. It is balanced, clear, biblical, and gracious. I highly recommend it.